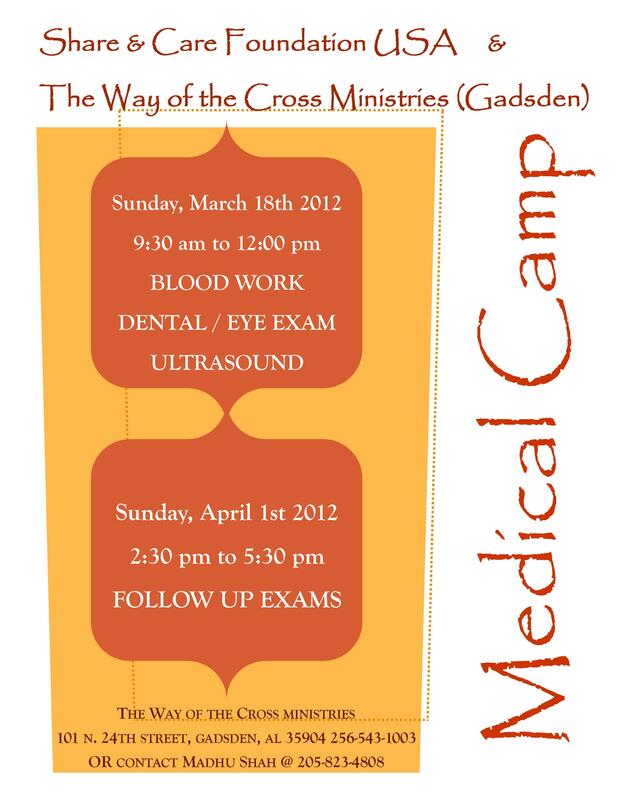 Share and Care Foundation and The Way of the Cross Ministries is arranging a Medical Camp. More than 110 people participated. About 70 people joined Blood work lab. Four Medical Doctors, Nursing Staff and 12 Volunteers made this medical camp successful. Thanks to our sponsor Mr & Mrs Robert and Tamara Starzl and The Way of the Cross Ministries Director Mr. Kenneth L Brown, Margaret Brown and Staff members. Also we thanks to Dr. Andy Brunson, Dr B.J Patel, Dr Jay Patel and Dr Dilip Shah and all volunteers. Dinner to Homeless People at Salvation Army. We served Dinner to 132 Homeless Men, Women, and Children on Sunday March 18th 2012. Thanks to our spomnsors: Kantaben Patel, Kuntal Pandit, & Neeralee Pandit. Salvation Army, 2130 11th Ave North, Birmingham AL USA. Dinner to Homeless People at Salvation Army. We have served Dinner to 132 Homeless Men, Women and Children on Sunday Feb 26th 2012. Thanks to Sponsor Vanita & Kanubhai Patel and Volunteers Kantaben Patel, Vanitaben Patel and Veena & Madhu Shah.